The collapse of the Roman Empire started in 410AD when the Visigoths, led by Alaric, sacked Rome. Romans were recalled from all regions of the Empire to defend Rome. And so the Romans left Britain - never to return. The land was left to the Celts. 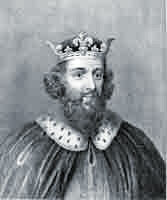 The next major element to have an influence on the rise of the Castles occurred during the reign of Alfred the Great. King Alfred the great introduced a National Defence system by the formation of 'Burhs' which meant "fortress". What was the difference between the Burhs and Castles? What were the Burhs & the Burhs? How were they maintained? What was the purpose of Burghal Hidage ? What was the Meaning & Origins of the word 'Burhs' & Burghs? 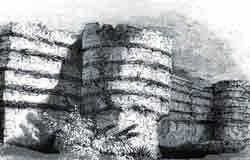 King Alfred the great introduced a National Defence system by the formation of 'Burhs' or 'Burghs' the meaning of which meant "fortress" or castle. The meaning gradually changed from "fortress," to "fortified town," to simply "town". The word 'Burhs' later changed to Burgh, Bury then Borough which are evident in many modern British place names. Any such place name is an immediate indication that signifies that a Burh was once built in the area. When the Romans left England the country was left to the English Celts. There was no one leader, or King. Law and civilisation broke down! The indigenous population of Southern England were the Celts. After the Romans left the land the English Celtic tribes were under attack form various forces - the Scots, the Welsh and then the Vikings! The Celts needed help and they arranged for foreign mercenaries from Europe to fight off these invaders. These foreign mercenaries were paid with land. The families of the mercenaries, many from Germany, also came to England. Theses German Mercenaries were called Saxons! The Saxons began taking over from the Celts, many of which were driven from the South England to the West and North of England. The Celts who remained integrated with the Saxons and the Anglo-Saxons were born - their land base was called Wessex. In 878 there was a massive attack by the Vikings - the King of Wessex at the time was called Alfred. King Alfred decided it was time to fight back and defend the land. King Alfred is the only English King to be given the title 'the Great'. He became King in 871 at the age of twenty-one. Following his victory against the Vikings at the Battle of Ashdown in 871 King Alfred the Great of Wessex in England introduced a National Defence system against the Viking invaders by the formation of 'Burhs' and 'Burgh Castles'. He organised his army to serve on a rota basis which enabled his thegns and peasants to take turns between tending their farms and serving in the army. In May 878 from a fortified base, or Burgh Castle, at Athelney in the Somerset , Alfred's army finally defeated the Danes at the Battle of Edington. The National Defence system of the Burhs was a brilliant idea. The Burhs ensured that all of King Alfred's subjects would be close to safety: None of Alfred's subjects would be more than 20 miles, or one day away, from a place of refuge! The 'Burhs' would house the people during enemy raids. Everyone took responsibility for building this system of defence. The 'Burhs', or fortified towns, were based and built on old Bronze Age and Roman fortifications and in important religious centers- these towns were usually near the coast, situated on high ground and surrounded by a wall and a ditch. Each man in the district was responsible for maintaining a section of the Burgh wall in exchange for a safe haven during enemy attacks. Why King Alfred was Great! Alfred was forever revered as the greatest military and cultural leader of Wessex and was rightly named Alfred the Great! The descendents of Alfred the Great were also given great credibility with the people. Alfred's son Edward the Elder continued the policy of building 'Burhs' and these followed the path of the old Roman Watling Road and reached as far as the kingdom of Mercia. Alfred's grandson Eadred followed the same plan, the Vikings were fought back and the Kingdoms of Wessex, Mercia and Northumbria were united as one country - England. The last Anglo-Saxon King of England was Harold Godwinson - King Harold II who was defeated by the Normans at the Battle of Hastings in 1066. The time in history moves to the Pre-Built Timber Castles of the Norman Invasion and the introduction by the Normans of the Motte and Bailey Castles.